IND’s goal remains to secure the widest most profitable distribution for the channels. As well as striving to accommodate each Territory’s distinctive demands to ensure customer satisfaction. Affiliation with the major platforms in international markets. IND covers the world with affiliated offices built on a cutting-edge infrastructure and staffed with dedicated professionals, to ensure the widest distribution, branding, marketing, sales and revenue generation for its channel partners. Mysat has been successfully operating since 2004, specializing in the management and provision of customized high quality Pay TV channels targeting niche markets in Australia and the Asia Pacific region. It is the largest foreign language platform in Australia located on the premier hotbird for foreign satellite services Intelsat 19. 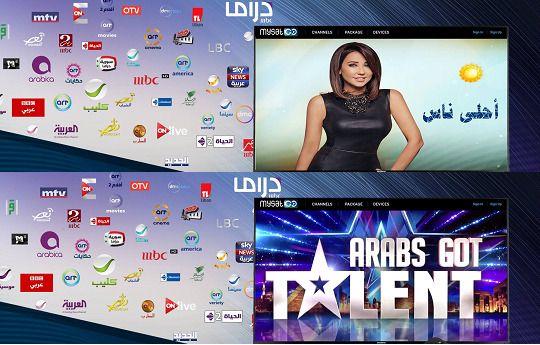 Mysat targets niche markets in the Australian continent offering packages that combine the best premium Arabic, Italian and Greek channels. MysatGo is the latest addition of Mysat and the leading edge innovation service for online entertainment that IND has to offer to its subscribers. MysatGo, an online TV platform offering top premium and multilingual channels that empowers subscribers the ability of total control over their entertainment. Viewers control how, where and when and what they want to watch, through a variety of devices, anytime, anywhere and at their own pace. The app also provides a top choice of VOD library, look back functionality options up to 8 hours and offers catch up TV. MysatGo caters to subscribers in Australia and New Zealand, Brazil and Canada region. Soon other territories to be included. MYSATGO OFFERS a diverse selection of more than 70 top premium channels ranging from General Entertainment, Movies, drama, Sports, Religious, News, Music and much more…more channels to be added shortly. "soon available on Foxtel Now boxes"
Reach Media Inc. has been a leading provider of in-language programming in North America for nearly two decades. Reach Media is in the business of building bridges to ethnic American viewers from different nations and backgrounds around the world. Reach Media serves the needs and interests of a diverse group of ethnic American communities by providing the finest in foreign language television programming from all over the world. Reach attains to providing programmers with promotional and advertising support including but not limited to digital, social media, print, out-of-home, grassroots, and events. It also provides in-language programming information and support to all customers across North America. Reach’s expertise in grassroots marketing techniques and strong presence in the market ensures reaching the target audience. Constantly aiming for credibility and exceptional value, IND has succeeded in providing exclusive significance while offering viewers the best selection of channels. IND custom tailors channels and programming to the viewing habits of viewers in each region distinctively. The majority of IND Channels are broadcasted in market Standard Times and customized to the viewing habits and preference of every region’s target audience. IND, relies on its strong and extensive network of marketing affiliates to promote the channel through territorial branding and innovative mass media Grass root marketing strategies, alliances with leading promotional and advertising media industries, dedicated call centre, presence at Cable trade shows and fairs, and community events. IND’s Market knowledge as well as insight gained from familiarity with the seasonality churn patterns and evolving market allows it to manage the distribution amidst the ever-growing piracy IND covers the world with affiliated offices built on a cutting-edge infrastructure and staffed with dedicated professionals, to ensure the widest distribution, branding, marketing, sales and revenue generation for its channel partners. IND has built profound Market Intelligence and an extensive database of clients to maximize advertising market share IND provides channels exclusive immediate access to the right audience, allowing the viewer complete flexibility and a wide range of selection of the best television's channels. IND provides advertisers an integrated ad platform in the global market creating the ultimate commercial environment to position a brand. IND allows advertisers unlimited access to to ethnic viewers from different nations around the globe.